Even when your human friends won’t join you for a drink because they’re doing totally lame stuff like “going to work” or “not joining you for a drink,” your canine friend is always down for a visit to a neighborhood bar or outdoor patio. So grab a leash and take your pooch to any of these 40 dog-friendly establishments in town. A cozy old-school watering hole, Bucktown Pub has plenty of outdoor patio seating in the summer and also welcomes pooches to hang out inside with the patrons. Wouldn’t it be hilarious if The Corner Bar wasn’t actually located on a corner? Yes, it would. Buuuut, it also totally is. And it serves really cheap beers (as low as $1.75) while you hang out with your dog inside. The underrated beer garden here is a great spot to catch a game in the summer, and the friendly waitstaff is quick to bring out a water bowl for Fido. A seasonal outdoor café offering excellent views of the lake, the aptly named Waterfront Café looks like a Key West joint if you down enough margaritas and maybe squint a bit. Doesn’t it kind of seem like everyone in Gold Coast is walking a small dog at all times? It does, and they’re probably going to hang out at Bistronomic, which has sidewalk seating where dogs are welcome to hang. 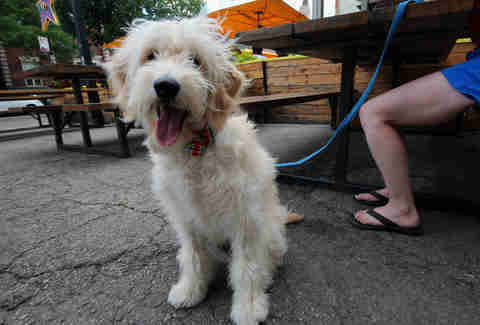 One of Chicago’s most beloved dives, Archie’s welcomes your pooch to hang out inside the bar until about 11 pm. Just don’t feed it too many cheese balls. One of the South Side’s trending hangouts, The Promontory has outdoor seating where your dog is more than welcome to chillax. This Irving Park spot is dog-friendly inasmuch as the Insane Clown Posse loves Faygo and hates magnets. Don’t be surprised to find a dog or two sitting on a stool next to the bar here. You won’t find cats hanging out at Ten Cat Tavern, let alone 10 of them, because that would be ridiculous. However, you will find dogs because that’s awesome, and they’re allowed to hang out inside the bar. Offering solid Bloody Marys and tasty comfort foods such as skillet cornbread and lobster deviled eggs, Crosby’s Kitchen is a great spot to do dinner with your pooch on the outdoor seating. At Jake’s Pub you’ll find pool, darts, a jukebox, and probably other dogs that will keep yours company inside the bar. Ping-pong, pool, cold beer, and dogs hanging out inside. What else would you want from a local dive? A solid spot for people-watching on game day as you hang out with your dog on the outdoor patio. Sure, you can hang out on your porch with your dog and a paper-bagged 40 in hand, or you can do the same on Schoolyard Tavern’s sidewalk patio. Come for the curry chips and craft beers. Stay to chill out with your pup on the sidewalk seating. 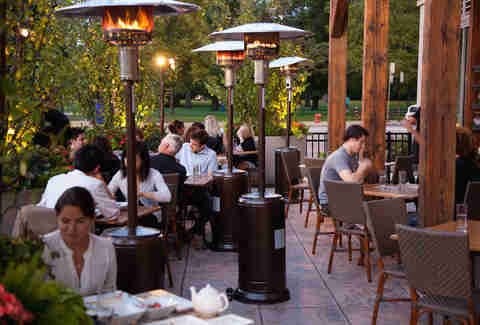 Perennial Virant’s outdoor patio is a great spot to grab some upscale eats and hang out with your dog before/after a visit to nearby Lincoln Park. This retro-styled lounge has charm to spare, and it welcomes patrons to enjoy a classic cocktail while hanging out with their pup on the sidewalk patio. An old-school pub that’s purportedly been around since 1946, River Shannon is a great spot to hang out with Fido inside the bar while munching on popcorn and playing giant Jenga. 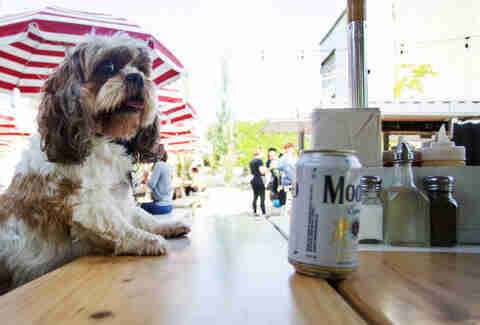 This neighborhood bar will let your pooch inside, and you can also wash down a cold beer or 12 with free pretzel rods. Boasting one of the liveliest outdoor patios in town, Parson’s has plenty of room for dogs and spirited games of ping-pong. There aren’t many Michelin-starred restaurants that welcome dogs, but you can bring yours to the partially outdoor Off Site Bar in the back. There aren’t too many establishments to take your dog to in the Loop, but the staff at 312 Chicago are happy to hook your pooch up with a bowl of water while you lounge on the outdoor patio. Take advantage of cheap beer, pool, and a jukebox while your dog also hangs out inside the bar at Grace Street Tap. 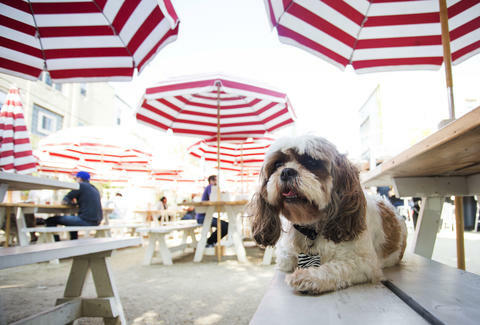 Grab a seat on the outdoor patio, order up one of Chicago’s best burgers and some Old Bay fries, and sneak some bites to your four-legged amigo. Besides boasting one of the best whiskey selections in Chicago, Clark Street Ale House lets you hang out inside with your pooch. 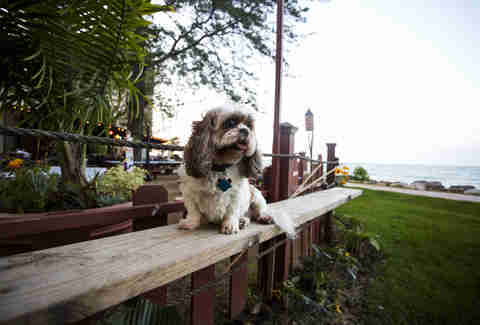 If your pup is used to the lavish lifestyle, it’ll probably appreciate hanging out on the dog-friendly Pierrot Gourmet patio, which is located at The Peninsula hotel. Orrrr not, because it’s a dog and just wants to chase tennis balls. 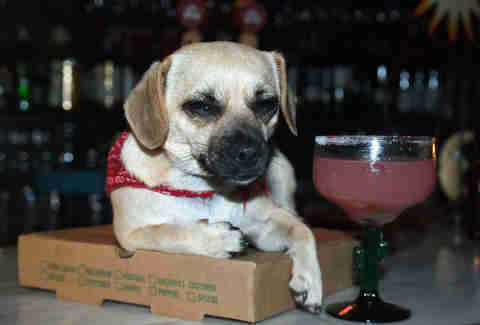 Stop in for the pool table and karaoke, and stick around because the drinks are cheap and your dog can hang out inside. Offering solid Italian eats and a corner location that’s great for people-watching, Frasca has a nice sidewalk patio where you can hang with Fido. 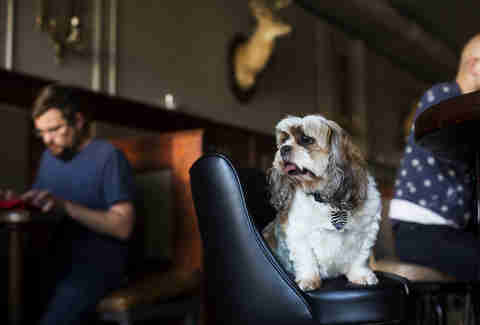 One of the most-inviting bars in the South Loop, Kasey’s offers a decent beer list and also lets dogs party it up inside. Square One offers wine, cheese, and outdoor dining alongside Michigan Avenue. And Fido is welcome to join. Howells & Hood’s taps pour more than 100 beers (and a few wines), while the big outdoor patio has plenty of room for your pooch. Just because you want to dine at one of Chicago’s best new restaurants doesn’t mean you have to leave your dog at home. Also, hope you like meat. 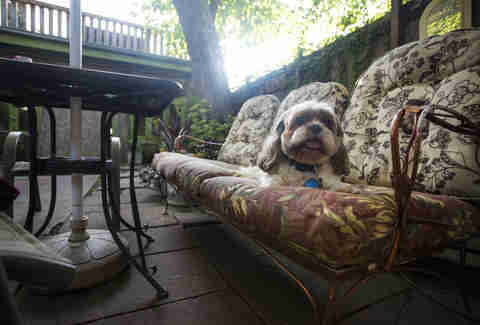 The scenic backyard patio is a great place to hang out with your dog while knocking back solid cocktails. Fatpour has one of the biggest beer selections in town, fried cheese curds, and a spacious sidewalk patio where your dog can hang out. It’s only appropriate that one of the diviest dives in Chicago also lets dogs inside the bar. Shoot some stick, down a few $5 shot-and-beer combos, and let your pooch drag you home. The tent-topped outdoor patio here really is one of the most coveted in the area, so arrive with your pooch early on summer evenings if you want to snag a spot. A classic dive, Innertown Pub has plenty of goofy stuff on the walls, a pool table, and a lenient policy towards letting dogs inside. This historic dive isn’t exactly the most-spacious watering hole around, but it'll still let Fido in until about 11pm. You know about it. Your mom knows about it. Your dog knows about it. (Everyone knows about it.) 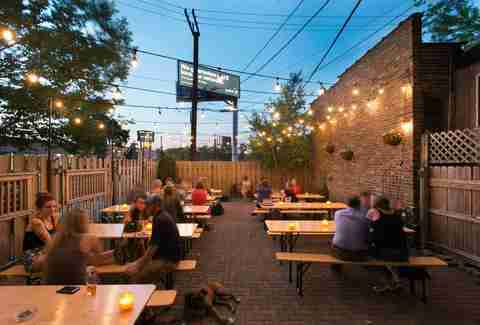 It’s one of the trendiest outdoor patios in Chicago. Your dog probably won’t be the only one hanging out on The Boundary’s popular outdoor patio, and you can also sample more than 120 beers. Not in one visit though. BAD IDEA. Raf doesn’t have a dog, but he’ll totally take yours to a bar. Book an appointment: @RafFoSho.